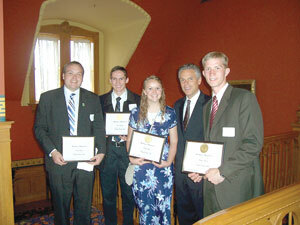 Four College of Eastern Utah students were honored by Gov. Jon M. Huntsman Jr. on Thursday, Nov. 9 at the Governor’s Scholars Luncheon in Salt Lake City. Four scholars from each of the 11 public and private colleges in Utah met the governor for lunch and heard from the commissioner of higher education and president emeritus from the University of Utah. Isaac Goodrich, Price, Carbon High School; Heather Gray, Clinton, Clearfield High School; Thomas Hebdon, Paradise, Mountain Crest High School; and Daren Larsen, Brigham City, Union High School; were nominated by the CEU faculty with final selections made by Vice President of Academics, Mike King. He chose the students on recommendations of their academics and service to the college. The students attended a reception at the Governor’s Mansion where they were greeted by Huntsman. He acknowledged each one individually and congratulated them as representing the top of their class at each college and university. Gray told the governor that she was majoring in early childhood education and he smiled as he told her the state needs more teachers. After lunch, Richard E. Kendell, Utah’s commissioner of higher education, talked to the students and introduced Chase Peterson, professor of medicine and president emeritus at the U of U.
Peterson told the students as scholars, the sky is the limit. Go and do what you learned in school … use the skills you learned and attain your dreams. Following the speech, each scholar was presented with a plaque. Besides CEU, schools represented at the luncheon included Brigham Young University, the U of U, Utah State University, Dixie State College, Utah Valley State College, Salt Lake Community College, Weber State University, Snow College, Westminster College and Southern Utah University.